"Combining two of the holiday season's best flavors, this dessert is easy to make and a crowd pleaser! If you are feeling fancy, you can pipe your top layer of whipped cream on the trifle. 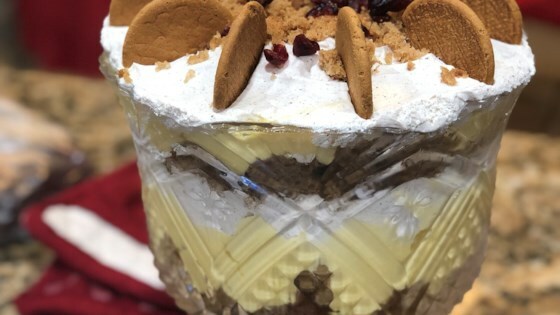 Since I normally travel with this dessert and put a lid on it, I just spread a nice thick layer on top and then sprinkle with some chopped dried cranberries and crumbled gingerbread cookies." Crumble 1/2 of the gingerbread into the bottom of a trifle bowl or a large glass bowl. Spread 1/2 of the eggnog pudding over the gingerbread, then spread 1/2 of the whipped cream on top of the pudding. Repeat the layers with the remaining gingerbread, pudding, and whipped cream. Refrigerate 6 hours or overnight. Sprinkle the top with the cranberries and cookie crumbs before serving. You can use already made whipped cream, but I prefer to flavor my whipped cream myself. You can substitute bourbon for the vanilla extract in the whipped cream if you like. If you use low-fat eggnog for the pudding, your pudding will be loose. I am not great with guessing volume - so I measured. For presentation this recipe requires a 10 cup bowl to fill to the brim. This was good but the eggnog was a little overpowering. I think next time I make it I will use half eggnog and half milk for the pudding. Ginger bread lovers get ready for a great treat. Made a trial run this morning. Will serve this New Years Eve. Deffinately try this. This is REALLY very, very tasty. I brought an empty bowl home from the company Christmas party. I love the eggnog pudding, and next time I might double the pudding part because it was so good.